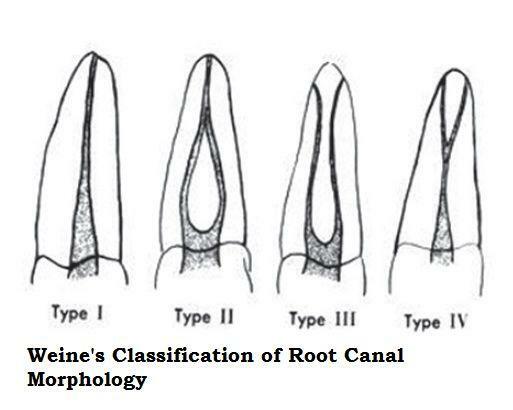 Weine Classified Root Canal System and is Morphology based on three factors – Number of Canal Orifices, number of Canals and Number of Foramina in each tooth. Based on this we can classify the Root Canals and depending on it the difficulty of the Root canal Treatment procedure can be ascertained and the type of File System and Obturation technique to be used. Number of Root Canals: Number of Root canals can vary many times and one tooth is never the same as given in a book. There can be multiple root canals in lower incissor as well so always keeping out an eye for extra root canals is a must. Root Curvatures: This is mainly seen in Molars where the roots are curved either in the middle third of the root which makes BMP very difficult and the use of Ni Ti file system becomes compulsory. Other cases are Di-lacerated Roots. Lateral or Accessory Canals: These are also seen in many cases and these can be exposed with the help of proper and meticulous Irrigation of the Root Canal with warm Hypochlorite and EDTA. Position of Apical Foramen or Foramina: There is no rule that the Apical Foramen should be at the tip or apex of the root, it is many times seen along the side of the root as well so having an idea of the apex through radiograph can help you access the correct Working length. i read you post. have some doubts. Is there any possibilities for side effect in this way. and how much days we having pain .